Qatar Ar-Raya newspaper reported that an Egyptian couple discovered a rare coin that could be a legendary Saint-Gaudens 1933 $20 Double Eagle. These particular coins have an extremely unique and fascinating history. According to the 2008 Official Red Book®—A Guide Book of United States Coins, only 13 specimens are known to have survived. In fact, the U.S. Treasury indicates only one 1933 $20 Double Eagle has ever been monetized and issued by the United States Mint. This very coin was initially seized by the Secret Service in 1996. Why? 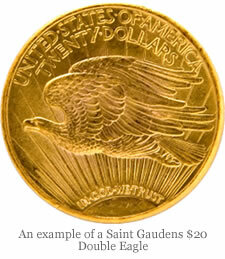 Owning a 1933 double eagle has been considered "illegal", as there are no official records of any leaving the Mint. … The net proceeds from the sale will be divided between the United States Mint Public Enterprise Fund and the coin dealer from whom the coin was recovered by the U.S. Secret Service in 1996." No one knows for sure how many 1933 $20 Double Eagle coins may have made their way into some collector’s hands over the years. While it would seem unusual to find such a valuable coin within an old box and in a closet like the couple did, you just never know with the mystery surrounding these coins. This find of rare $20 Gold Coin made thid Egyptian Couple very rich and but not fameous. Just in case their identy should be secret for own privacy. Anyway good luck to you for finding this rare coin!